A unique four-piece cocktail shaker made of glass and stainless steel. Love this shaker! This is my second one. It pours so nicely. A shot of Americana, a jigger of Southern sensibility, a dash of design ingenuity, and what have you got? 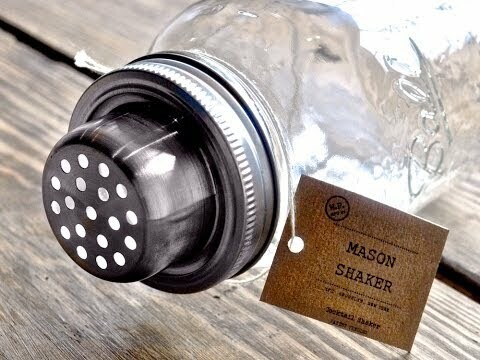 The Mason Shaker. Founders and childhood friends Eric and Josh were raised with an appreciation for vintage Americana, especially the iconic Mason jar, a bar and restaurant staple down South where they grew up. Known for fashioning Old Fashioneds from any impromptu kitchen objects available, the friends (now located in Brooklyn, NY) decided it was time to re-tool their favorite glass jars into cocktail shakers. Before you could say "Cheers," the Mason Shaker was born. Equipped with a cap and strainer, the Mason Shaker is ready to mix, shake, and serve.